Liverpool captain Steven Gerrard was sent off in the 2-1 defeat against Manchester United just 48 seconds after coming on as a half-time substitute. The 34-year-old, who is due to join LA Galaxy at the end of the season, appeared to stamp on Ander Herrera after the Spaniard tackled him. Gerrard has just returned from injury and is now set to miss three games. That includes the FA Cup quarter-final replay against Blackburn, and two of eight remaining Premier League games. Liverpool were already trailing 1-0 when Gerrard was dismissed by referee Martin Atkinson. After appearing for the second half, the captain put in a robust challenge on goalscorer Juan Mata, with Herrera responding with a firm tackle on Gerrard, for which the Manchester United midfielder was booked. 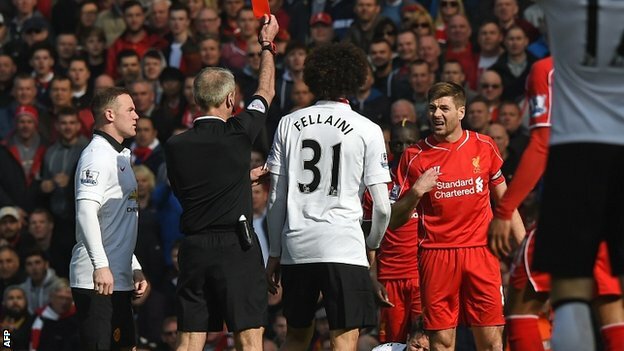 TV replays showed that Gerrard reacted by appearing to stamp on Herrera as he lay on the ground and he was shown the sixth red card of his Premier League career. The former England captain announced in January that he was leaving Anfield after joining the Reds aged nine, and was lauded by many as the club's greatest ever player. But with only a handful of games left to play for Liverpool, he could hardly have anticipated such a disappointing end to his final season. After announcing his departure and subsequent move to Los Angeles, he said: "From now until the last kick of the last game of the season, I will be as fully committed to the team as I ever have been and giving everything I have to help Liverpool win games." Gerrard, who made his Liverpool debut in 1998, led the club to the Champions League title in 2005, and has won a further nine trophies in his career.